hurrah hooray!!! nothing quite like a new shiny year! i could not see what all the fuss was about. i have noted that there is something perfectly peachy about starting a new one. a new page if you will. but i am, and i might add i have even felt a little giddy when looking towards it. some thing to make the year know i was happy to see it. things that might make me sad are pushed aside. the result of my 'crafting whilst pottling' was a little diorama. actually it is not little, it is quite big. i found the drawer from an old desk my man was using to store seeds in outside. however my big drawer, is full of little things. then some new shiny resolutions!!! i tippity typed mine on a piece of paper taken from my granny's exercise book. before a resolution is broken. lost in the black hole in my bonce that most things fall through if i do not put pen to paper quickly. the first day after her return to the shed. to make him feel even more splendid i crocheted him a cape. we returned somewhat with heavy hearts and sat upon the couch. "that is quite the thing you have going on there isn't it?" directed at my new shiny year diorama. "is it the year of the rabbit then?" "he found me and i thought him quite lovely". and more to the point the rabbit only comes around every 12 years. and put him in my 'new shiny 2011 year' box. a very lucky sign telling me, 2011 will be most shiny indeed. Happy Shiny Year to you too Dottie! It sounds like you have plenty planned to keep you busy. I'm a bit nervous about the year of the rabbit thing, our girls have been pestering us for years about getting some real ones. Maybe I could find some bunnies like the one you found instead? Enjoy your crafting sessions and I've heard that chocolate is really good for you so don't worry too much about that one. Thanks Tiff - Great post. And a very Happy New Year to you!. I love your new year box, lovely idea. You are so right, we have been gifted a shiny new year! Great resolutions - here's to a fantastic and yes shiny New Year! I too am looking forward to this shiny new year and am most happy to hear you using the word shiny, it is a word I am quite fond of you know. All the best in 2011 my dearest!!! Rsolutions, oh the big problem for me... I do have not but this year a blog friend tags me... so It was an obligation to find it. Well I for one am so happy to have found your blog, as my own resolution to smile more will be easy to accomplish with regular visits over here. Thank you very much! p.s. adore your shiny new year diorama and the bunny with the crocheted capelet! So good to have you back blogging after the holidays have passed. You gave me much to smile about and to ponder. Happy, happy year! Oh, what an uplifting post! Happy New Year to you! 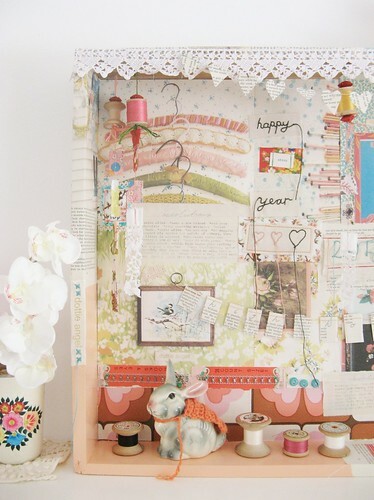 I love your Year of the Rabbit shiny year diorama - and your (very long) list of resolutions. My, you must be feeling optimistic! If I can steal two of them, I'll take Stop Counting Wrinkles...and Write More Snail Mail. Thanks, this was so much fun! Happy New Year Tif. I love your creativeness and reading your blog. Hey Tif, happy new year to you and yours and your 'new' bunny is indeed very shiny and sweet. It looks like a bunny with super duper powers with it's little crocheted cape. Nice of your man to notice your new diorama and comment in a positive way. I am sure you had some wonderful thrifting adventures with your #1 by your side. P.S. Is this the first comment for 2011?? These are just the kind of resolutions to have, because they sound reasonable keepable. I love your thoughts., The bunny with his new cape is so cute. Can't believe that it IS the year of the rabbit. That should bring you good luck for sure. Hope your new year goes well. What a lovely idea,Tif -pottling certainly is the best craft of all...the rescuing of the little rabbit with the lovely crocheted cape is surely a sign of shiny things to come.Happy new Year. What a perfectly lovely new shiny year diorama. Your bunny is so cute with his little cape. is your fella Brit as well, Tif? Lovely to have you back, Tif! 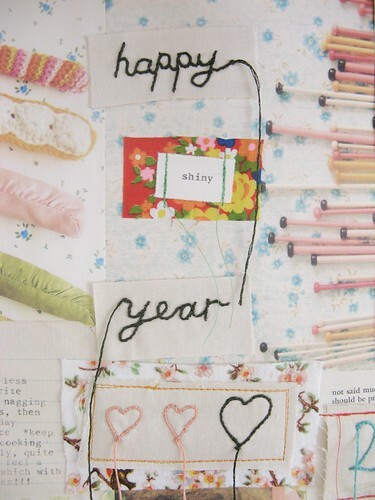 I hope you have a happy 2011. That was such fun to read. I have a good feeling about 2011 too...and why not! oh how lovely to hear from you all! hope all your mountains are mole hills this weekend my dears! What a lovely post..and I am with you I am hoping that 2011 will be a bright and sunny year..I am excited what the year will bring to your lovely blog..Happy Shiny New year..
My smiling grew for every line of this wonderful post. And that is the most beautiful, funny and inspiring box I have ever seen. Love the threads, the cape, the mix, everything. Amazing. Thank-you, Dottie. I needed that. Now forget reading other blogs. I'm going to go make something NOW. Fantastic resolutions, and gosh how wonderful about the bunny, doesn't the world work in such wonderful ways sometimes? Wishing you the happiest of new years and best of luck with those resolutions, there really are quite a lot! I love your diorama btw, inspired, as always. I had to look at your flickr since you were gone so long. I loved the photos! I feel for you, I really do. I was a mess when my kids were merely out of state. Still am, now that they have flown the coop for Euroland. (pat pat) Well, there's family there for yours, that's a relief! An excellent choice of new years resolutions and so beautifully displayed. Quite inspired. I think my favourite one is to use hankies, very sensible. Happy New Year Tif, don't like to think of you as so much of a 'forsaken' soul but one ensconced in your little mossy shed with ...all the love in the world...!! Have a wonderfully 'molehilly' year. I've enjoyed your lovely catch-us-up post this Sunday morning...just the thing for a Sunday...quite perfect in fact! Happy new Year to you and your brood Tif! And you also have your new friend ('rabbit')resolution already done....or was that before Christmas? Sorry, I can't remember..
Love the diorama. never heard of one over here, but they're a good idea, and yours looks scrummy. Oh Tif how WONDERFUL to find a FRESH SHINY new post from you on my return from the market today....WELCOME BACK.... :o) !! I'm LOVIN' your little diorama....Tis positively PEACHY....!!!!! I hope you have a SPLENDID year....I'm looking forward to sharing your thrifty adventures....! 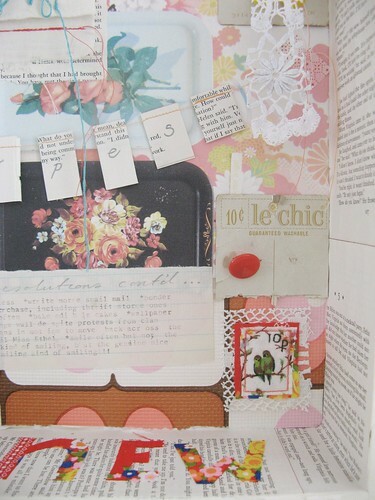 Dear Tif.. loved your post and your diorama. I have a plant/friend suggestion for you. I read an article about the 10 plants that add the most oxygen to your home and one of the top ones was a Sansevieria - Mother-in-law tongue or Snake Plant, and they are VERY easy to take care of. I just got one after I read that article and it's doing superb. 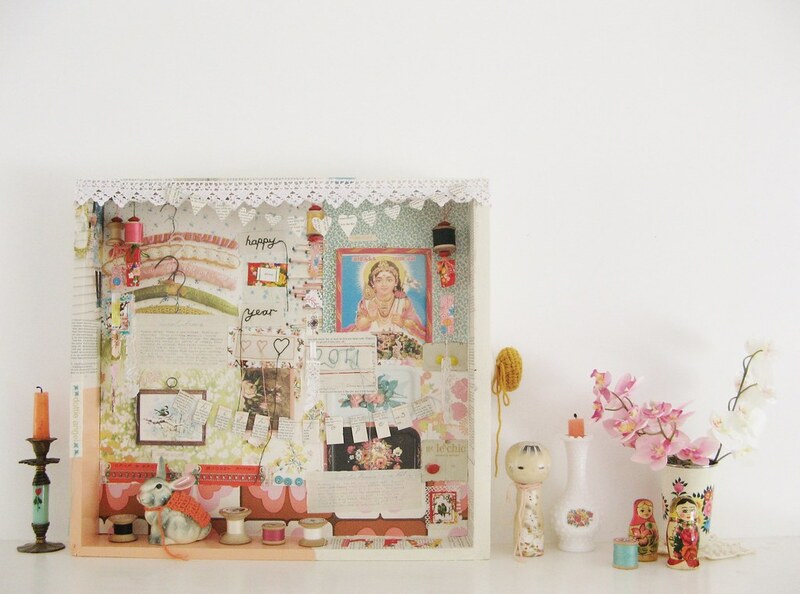 gosh thank you for all the lovely words about my little new shiny year diorama!! and i am delighted to report today was a very good day for hankie use... something comforting knowing a hankie is close by in pocket for all emergencies no matter where you are! Love the diorama and the resolutions...I look forward to seeing what the new year brings. the best of happiness and health to you for 2011, no doubt you will make it a super-creative year. your posts are so beautiful, i could admire tham all day long. I do so wish we were neighbors, you seem to find the happy and prettiness of life...my wish for you is that you fulfill all of your resolutions and that you are content in doing so. Cheers. Happy New Year to you, too, Tiff! I love your resolutions and the diorama that you made for them. :) And your husband's comment. I am not reminded of my own diorama I wanted to make...so much to do in a new year! Good heavens above Tif, what a list of resolutions. It will take me until 2012 to digest all those! I have made just the one - try to keep smiling! Your new year diorama is amazing, really, really special. A perfect addition to the shed. My dear friend, I wish you the peachiest years with early sunrises, long warm perfect days, sunsets to make your heart zing and health and happiness for all those you hold dear. So beautiful & your resolution to smile more is worth it's weight in gold. Wishing you all the best in the new year! Tiff you are odd..but I do like you!! Hope there are a million smiles for you in 2011! What a lovely shiny post for a Shiny New Year! My favourite resolution of yours is to carry a vintage hankie. I used to always do that and I have the most gorgeous collection but I found that I didn't want to use them so would just sniffle instead. They make you happy when you open your purse and see them. Your rabbit is gorgeous especially with his cape! happy shiny new year to you too! I could have written the same list of lovely resolutions (except maybe for keeping a plant alive, I'm no longer allowed to bring them home for they will surely die)... and I love love LOVE that your bunny found you! he absolutely deserved that little cape. best of luck to you and yours this rabbit year. happy new year! I sure enjoy reading your blog and viewing those pictures! you and I have very similar aesthetics and taste! great list of new years resolutions too! i like your upbeat attitude on everyday life! hope your day is bright and crafty!!!!! 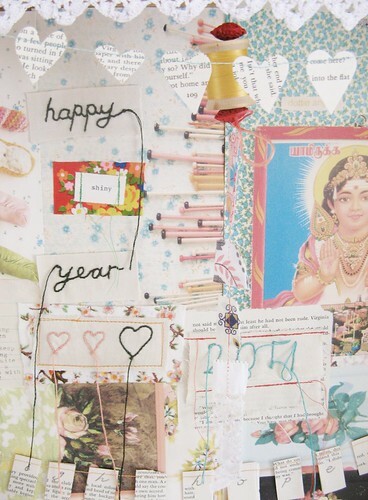 those are good resolutions...and really pretty crafts. Hi Tif, this is the very first time I read you...and I'm absolutely enchanting...I adore every little thing I see and read on this wonderful blog! I guess you're gonna be a sweet inspiration to me! I'll follow you and wish you a bright, happy 2011! My resolutions: 1) check in on Dottie Angel repeatedly to help reset my design compass (you help me to be more like me), and 2) check in on Dottie Angel repeatedly to help reset my design compass. oh! and the hankies? I keep a stash to give to girlfriends as gifts. What a charming (although a tad daunting) list of resolutions! 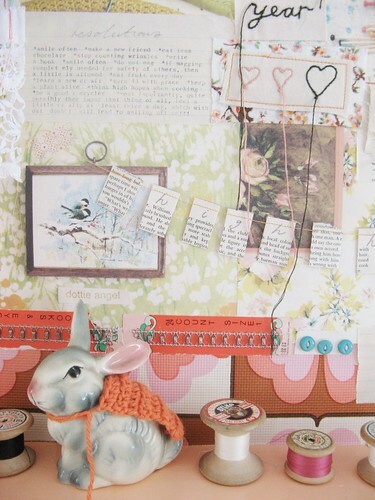 Love the knitted blankie on the little rabbit in your sparkly diorama. Had no idea it was the year of the rabbit. How exciting ! Don't you feel a certain bounce in your step? Must get hoppin,sooo much to do,Feeling like I'm late, I'm late.....for a very important date. 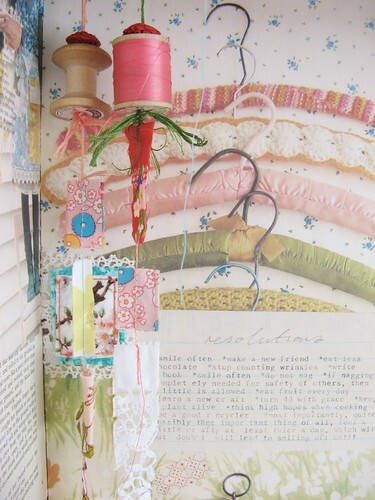 I so love your guzzied up NY drawer, especially the bobbins, lace, hearts, and words ~ all, just perfect! So glad your year is starting off so well. Blessings to your dear heart! Oh Tif! Happiest of year to you! I so love your diorama and I could stare at it for hours! It would make me happy hanging around. A pleasure to see how much love and passion you put into these things! I have never left a comment on your Blog before so I thought it was about time I did as I read it all the time. Tif you do make me laugh and I am truly inspired by your diorama to make some long overdue resolutions myself, especially to smile more often.I will indeed start tomorrow!!!! i am simply blushing with your loveliest of lovely comments!!! truly i am delighted you should like my resolutions, my diorama and my little 'good luck' bunny with his cape of crochet! as i read your words i was positively beaming, i wish you all the bestest of besty new shiny years!! Actually I should really be ashamed of myself! 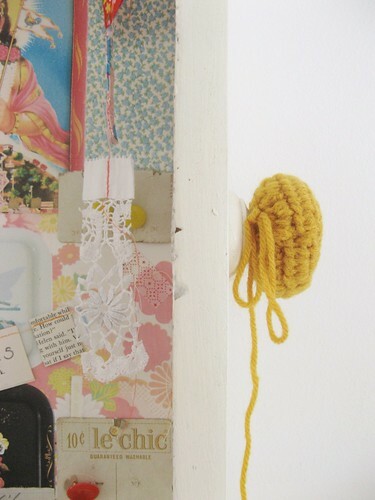 Enjoying your postings & craftings & everythings sooo much, and leaving a comment sooo seldom. Thnak you so much for sharing your thoughts & inspiring! Wish you a marvellous rabbit year!